GWR County (1000 Class): In game! It's been a few weeks since the last update but we have been very busy working on the GWR Counties (and also eating too much chocolate over Easter!). 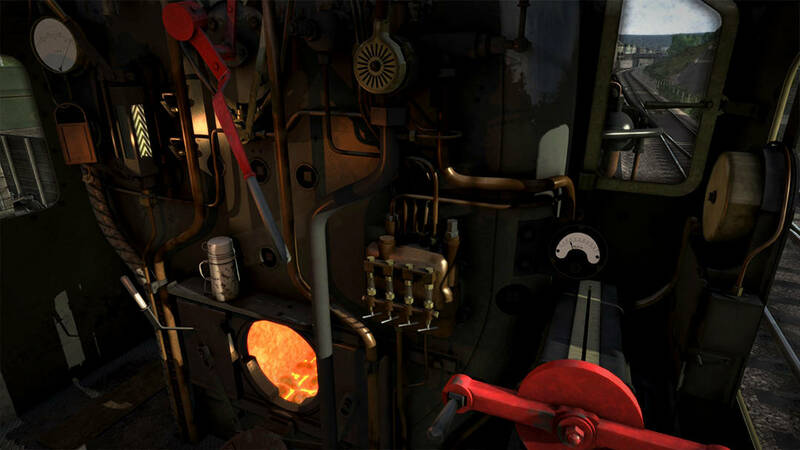 Dovetail Games were given a pre-beta set of engines and posted the following article the other day with some very nice pictures in it. They also included a clever little animated gif cycling through some of the variations but we wanted to clarify which engines are coming with the add-on and what their modifications are. In short... all of them are included! There were 30 members of the County class and the pack includes all 30 of them, correctly named and numbered and carrying the 3 sizes of nameplate board, depending on the length of the county name that they carry. For example, No. 1016 "County of Hants" carried its name on 72" plates whereas No. 1022 "County of Northampton" had its moniker on an 87" plate, with a 78" plate in between for the "medium" length names. There were essentially three main versions of the 1000 County class - the original version as built under the GWR from 1945 to 1947, the modified version which was updated under British Railways during 1956-59 and then No. 1000 "County of Middlesex" which was distinct to the other members of the class. The Counties also carried a few different liveries and we have included all of them in this add-on. 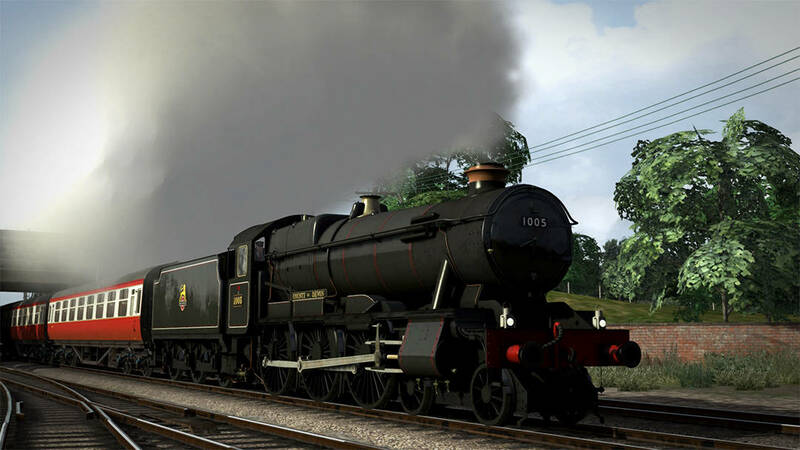 So, with the help of some images we will try and summarise the life of all of the County class engines and show you what you will be getting in our latest DLC. We begin in 1945 when the first Counties were built and they carried the standard 1945 GWR livery. At this time the engines ran at a whopping 280psi boiler pressure giving them a tractive effort of 32,580 lbf (almost 1000 lbf more than the Castle class) and they were fitted with a standard single, round GWR chimney. In 1948 when all of the Big Four railway companies merged to become British Railways many GWR engines had a short stint carrying the new company name but still in the old GWR style font. However this did not last very long and soon the Counties were painted in the new BR Mixed Traffic Black livery. The logo on the tender changed twice during this time: initially just the words "British Railways" in a simple white font, and then from 1950 this was replaced with the famous "Cycling Lion". Also under BR during 1951/2 they were fitted with speedometers and these are an optional part for all engines in game. In 1955/56 the Counties were repainted in lined green which they retained until the end of their lives in the early 1960's and in 1956 the old BR logo was replaced with the equally famous "Ferret with a Dartboard" crest. Those of you who are keen eyed will notice that the top right engine suddenly seems to have lost 30psi somewhere on its travels! In late 1954, No. 1009 "County of Carmarthen" was modified for a set of trials to look at the possibility of fitting the County with a 4 row superheater (instead of the previous 3 row version), an improved blastpipe and a double chimney. The engine was specially modified for this purpose being fitted with a temporary double chimney made of sheet steel and also had what can only be described as a "cabin" built on the buffer beam to allow engineers to monitor the modifications during test runs. And it would really be remiss of us not to include this version in the pack for some unusual scenario fun! During these changes the working boiler pressure was also reduced to 250psi as there was concern that the County class was producing a hammer blow effect that could damage the rails they ran on. The full set of modifications were applied to all members of the class from 1957 to 1959. So the above liveries and variants covers 29 of the 30 County class engines. But what of No. 1000 "County of Middlesex"? 1000 was unusual in that it carried a double chimney for its entire life so it has its own set of options in game, including the change to the superheater, blastpipe and pressure reduction. In total that makes 13 different versions of the County that you can drop into Train Simulator covering their entire existence, and with a new No. 1014 "County of Glamorgan" currently being built at Didcot there is the opportunity for preserved running as well. In the following weeks we'll take a look at more details of the GWR County class add-on: we have a cab to explore, advanced features to discuss and rolling stock to show.